Gals That Brunch is an international movement set out to find the very best brunch destinations & resources around the world while at the heart of it we're going after creating spaces to bring thousands of Gals That Brunchies together around the world through our 55+ Chapters in the US, Australia + growing… GTB (Gals That Brunch) exists to be a catalyst for community, women and all things BRUNCH (Of course :) )! Our mission is to create a positive, authentic and empowering atmosphere where women can connect with each other and find community within their city. While we are on our way to being the #1 Brunch Resource in the world, it is our heart beat is to see women walk in complete freedom, launched into their destinies, dreams and living the most beautiful stories life has to offer. 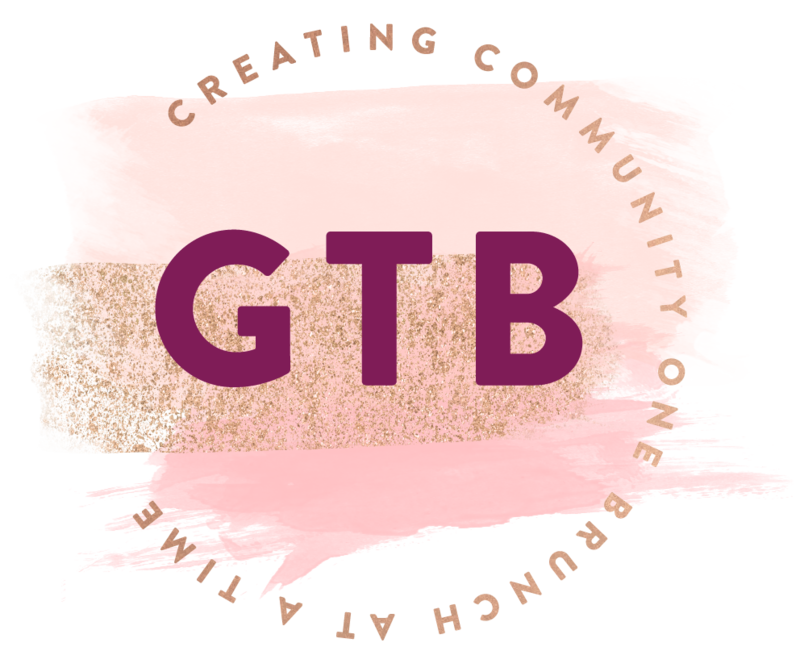 We believe when a group of women come together to encourage, empower, and speak into each other’s lives it changes lives, atmospheres, cities and our world... "Creating community one brunch at a time..."
GTB began in June 2015 at a popular brunch destination in Virginia Beach. Founder, Tiffany, had recently moved cross-country from Colorado for a job opportunity and was looking for a way to make new friends in a city where she knew not a one. After waiting two hours to save a table for the first brunch pop-up, she began nervously thinking, ‘What if no one shows up?’ Sure enough, 30 young women came together that day! They all met as complete strangers with one common goal: to find the best brunch spots in their city while making new friends, networking and establishing community amongst each other. At every brunch, we see an incredible mix of women from all stages of life. From young professionals to industry leaders; single sistas to supermoms. Some are new to the city and others are just looking to get out, enjoy a mimosa (or two) and meet new faces. While we begin each brunch as strangers, acquaintances, and friends – we end each brunch with a full belly and a full heart. Since the first event in June 2015, GTB has quickly grown with over 25,000 young women. From east coast to west coast, Gals That Brunch currently spans across 55 cities in 23 states and is continuously growing. Our core values lie within 1) the heart of community, 2) the feeling of belonging, and 3) finding the best brunch spots across the globe! The girls that make the brunch! Friends! I’m so glad you’re here. My name is Tiffany and I’m the ultimate advocate of people. I’m a farfetched dreamer #Boss Girl, along with being an ENFP, leadership coach, consultant and (of course) a passionate foodie. I’ve spent the majority of my life in Southern California; however, for the last five and a half years, I called Denver and Virginia Beach home as a a young professional – where Gals That Brunch was “birthed”. Since then, I’ve returned to San Diego, and have based Gals That brunch headquarters here while spending my time continuing to explore our local brunch scene with a greater outlook and perspective, meeting the most incredible women locally & globally and building community relationships with restaurants and local businesses. I have lived my life to make a bigger impact in some way, shape or form. My passion is to see people thrive, walk into everything that they were meant to be and live the greatest and most beautiful stories possible. I have the greatest family and friends – I love Jesus, people, singing, wine & beer flights, my chocolate lab - Milo and I LOVE to celebrate – every person, event, holiday, fake holiday and truly cherish the moments and people each occasion brings! Some Favorite Hometown Brunches (so far): Bay Local & Commune (VA Beach), One Fold, Denver Biscuit & Rootdown (Denver), Queenstown Public House & Trust (San Diego). As THE Cravings Queen, I believe that few things in life are as good as a good meal. When I’m not cooking or eating, I’m writing about my favorite recipes or a good restaurant. My Instagram is almost entirely dedicated to some of the delicious meals that I’ve eaten. I firmly believe that everything is better with bacon, and I take great pride in the fact that I can eat an entire pound in one sitting. When I moved from Baltimore to Virginia Beach in 2015, I never thought I’d find a community where I could eat at different restaurants and make a ton of amazing girl friends at the same time. Gals That Brunch has not only given me the opportunity to make lifelong friends, but also an outlet to write about my favorite meal, brunch. Check out more of my work on my website. Hey there, I’m Jubilee. I am California girl born and raised now living in Denver, CO these days. As a San Diego native I love everything about the ocean and feel most alive in its presence (now trying to find that here in the mountains). I am a consultant by day, coffee connoisseur for fun and a mermaid at heart. Of the things I am, my absolute favorite is being an aunt. I have never met a cheese I didn’t like. And coffee is my love language. I am passionate about my family, animals and FOOD. Also, baking is my jam. And breakfast foods are hands-down my favorite, so why not brunch on a regular basis? I am a true believer that life was meant to be done in community and not alone… so what a perfect way to gather around the table and build community with other lovely gals. I am excited to meet you all over some scrumptious brunch food and a mimosa or two. I am a native-born Chicagoan turned New York Explorer. I am just starting off as a small business owner in the event/wedding planning industry. I taught special education on the west side of Chicago before deciding to change careers. I am an avid lover of brunch, craft cocktails and beer, good food, and great company! I am thrilled about the opportunity to expand my list of brunch spots in NYC and meeting new people. Hello from Wendy! I'm a Jersey Girl married to a PA Guy living with our two kiddos in Rochester, New York. I wear many hats -- Mom, Wife, Friend, Photographer, Cat Lady, Down Syndrome Advocate, Wannabe Yogi and an introvert who always gets confused for an extrovert. I get cranky if I don't eat every 90 minutes and I love telling stories, learning stories, reading stories and sharing stories. I don't care where you are in the world -- there is something beautiful and soothing about a windowseat in a cafe. I'm always looking forward to the next adventure. Hi! I’m Jennifer Grace Lopez, blogger and mental health enthusiast. I am a Los Angeles native, who now resides in San Diego with my husband, Victor, and two cat-children. Some of my passions include: podcasts, personal development, brunching and beach jogging. You can find more of my work on my website! Paula has been a part of Gals that Brunch since April 2017. She has been a group fitness instructor since 2008, teaching classes from Zumba, spin, kickboxing and TRX. Paula holds doctorate degree in exercise physiology. She’s currently a physiology research associate with the US Navy (DoD contractor) in the Warfighter Performance department. When she’s not working, working out or brunching, Paula hangs out with her pup Perceval. Originally from small town Idaho, I've made way across the country to Washington DC! I'm a graphic designer with a small business called 23&9 Creative - designing websites + brands for bold #bossladies! A few random facts: I love Crossfit. I love coffee. I love Gilmore Girls. I love cooking. I love my semi-evil cat who used to be on Xanax. I love sleeping in. I love Taylor Swift. I love tiny homes. I love margaritas. Talk to me about any of these and we will be bffs.